The ancient Greek "sign of the fish" (Ichthys) is an instantly recognizable Christian symbol in pop culture. It is used on car bumpers, clothing, jewelry, business logos, and more. 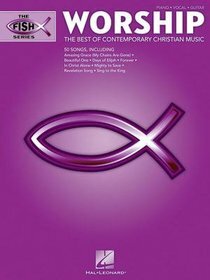 Hal Leonard is proud to offer The Fish Series, showcasing the wide variety of music styles that comprise the Contemporary Christian genre. From the early pioneers of CCM to today's current hits, there's something for everyone! 50 songs perfect for a worship band or solo praise, including: Amazing Grace (My Chains Are Gone) * Beautiful One * Days of Elijah * Forever * In Christ Alone * Mighty to Save * Revelation Song * Sing to the King * and many more. About "Fish Series: Worship Music Book Purple (Music Book) (Piano/vocal/guitar)"